Weather forecast: It should feel very cool and unseasonably unkind with real feel around 38 degrees. Virtually no chance of rain but high humidity. There hasn't been much movement teamwise for the top 1A girls all season... and maybe that will change or maybe it won't, but it will all be settled by the time 9:30 am rolls around. There hasn't been much movement in the 1A polls all season. Starting out in the #2 pre-season slot, Unity rocketed to the top in week three and never looked back. Aside from a second place finish to #3 2A Mahomet-Seymour 96-104 at the Metamora Invite, the Rockets have been on a rampage, winning every other meet. While they have yet to meet, the Eureka has also had a phenomenal season. They have won every meet they've run so far this year, even beating Mahomet-Seymour. The Hornets are led by defending state champion senior Emma Argo, who also has an undefeated streak so far. At this point, it's basically a fight for the third place as Eureka and Unity duke it out for the championship title. That doesn't mean the third place is just given away though, there are many teams who have equally great chances against each other. Herscher, Rock Falls and St. Joseph-Ogden are the most likely to get the last spot on the podium. These teams hardly meet so it's hard to truly gauge how they will do against each other. St. Joseph-Ogden has the most experience racing Unity, coming second to them at conference, regionals, and sectionals. On the handful of times, they didn't race Unity, the Spartans finally got to their chance to shine and win some meets. Rock Falls has a fairly dominant season, defeating #9 2A Dixon girls at Conference, and holding off rival Winnebago by winning conference, regionals, and sectionals. Herscher has had success on their own part too, winning their regional and sectionals. The Tigers have the added benefit of having beat St. Joseph-Ogden, granted it as at the beginning of the season they still have that race experience against them. Other notable teams include Winnebago, who have traded wins with Rock Falls all season; Stanford Olympia and El Paso-Gridley have battled it out all season, and will both have a fighting chance for that number three spot. Is there anyone out there who can beat Emma Argo? This has been a standout year for individuals, with many familiar names and some new. As mentioned previously Emma Argo is the one to beat. As defending champion, won state year and has the fastest time in the classification by around 16 seconds. A back-to-back state title would be the icing on Argo's undefeated cake. Just because she won last year does not mean Argo is invincible though, as now she has a large target on her back. There were only three seniors out of the top 25 finishers last year from last year's state meet, so all of them have a chance for redemption. Sophomore Karlie Hey is one of only two members of the Newman Central Catholic's cross-country team, but she's made monumental moves. Hey's one loss this season has come from Argo, but other than that Hey has dominated her competition. As a freshman last year, Hey placed fourth, so her future certainly looks bright. Finishing in second last year was class of 2020 Ailey Mitchell of Shelbyville. Mitchell has had an excellent junior season so far, placing second and regionals and sectionals. Mitchell lost to Sophomore Lydia Roller of Staunton. Roller has had an impressive season; aside from winning her regional and sectional meet, she placed second to Argo at First to the First Invitational, losing by only .8 seconds. Additionally, Roller has the number two time in the state after her 17:23 at sectionals. Also throwing her name in the hat is Amelia McLain of Benton. 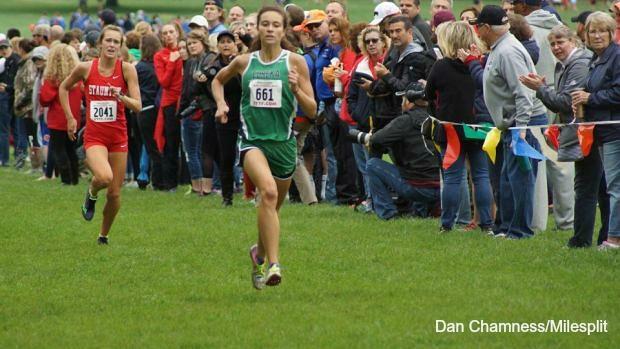 Mclain's only loss was the 5th place finish at the Peoria Invitational against many talented 2A runners such as 2017 2A state champion Jenna Schwartz of Waterloo. McLain also boasts the third fastest time in 1A, only 2 seconds ahead of Alyssa McPike of Monticello. Senior Katelyn Robbins of Liberty is another top contender, winning her regional and placing second to Argo at sectionals. Closely behind Robbins and Argo was Argo's own teammate, sophomore Alexi Fogo and junior Payne Turney of Clinton. Fogo will be in great shape to carry on Argo's torch next year and Turney has a pretty impressive resumé herself, placing 7th at state her freshman year and 35th last. Overall, the 1A girl's race could really be anybody's race. You never know what magic can happen at state.